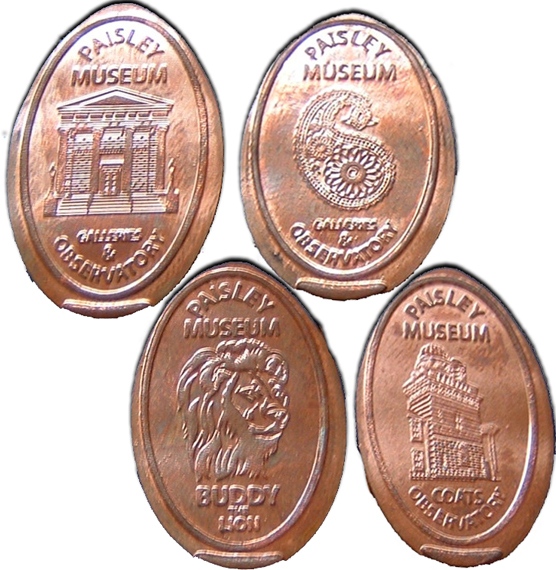 Sept 2018 - Machine has been retired since 2017 <br> machine details updated by A Tait <b>https://www.scottishpennies.com/</b> <p> Paisley Museum opened in 1871. The building was designed by the well-known Glasgow architect John Honeyman and was paid for by Sir Peter Coats of the famous Coats thread manufacturing family. <br> This late 19th century museum and art gallery houses the world famous collection of Paisley shawls. Displays trace the history of the Paisley pattern, the development of weaving techniques and the social aspects of what was a tight-knit weaving community. There are also fine collections of local history, natural history, ceramics and Scottish paintings, as well as a series of changing exhibitions throughout the year. Also on site you’ll find the Coats Observatory; one of only four public observatories in the country.<p> Designs were:<br> 1) Front Of Building.<br> 2) Famous Paisley Pattern.<br> 3) Coats Observatory.<br> 4) Buddy The Lion. This late 19th century museum and art gallery houses the world famous collection of Paisley shawls. Displays trace the history of the Paisley pattern, the development of weaving techniques and the social aspects of what was a tight-knit weaving community. There are also fine collections of local history, natural history, ceramics and Scottish paintings, as well as a series of changing exhibitions throughout the year. Also on site you’ll find the Coats Observatory; one of only four public observatories in the country.